Our church is embarking on an exciting journey of learning and inspiration about our worship through a subscription to an on-line resource called “The Worship Design Studio, (WDS)” that will guide us as we discern how best to enhance what we already do while honoring our great Christian tradition of worship. The Greek word for worship–leitourgia–usually translated as “liturgy,” literally means, “the work of the people.” The underlying principal in the Worship Design Studio is that planning worship should also be the work of the people, as well as what we do in our weekly worship. So, this virtual online learning and planning application will help more of us be involved in evaluating and planning our worship. Being part of a worship team could become one of the most vibrant, vital and fun ways to carry out our discipleship. It includes bible study, theology, artistry, mission, commitment, spiritual direction and fellowship. It can be multigenerational and include those of you who consider themselves “creative” as well as those who simply want to help carry out simple tasks. You can spend as much or as little time as you can (and do a lot of it right from your computer). As we begin to explore this resource, we will let you know how you can be involved. Feel free to see more information at: www.worshipdesignstudio.com and let me know if you’d like to get access to our subscription. Throughout the season of Lent, we have been using resources from WDS which were inspired by the book Gifts of the Dark Wood, written by Eric Elnes. Our worship has been enhanced by the visual displays set up by the Art Club and we learned new music, supported by our excellent musicians. The positive response during Lent has encouraged us to move forward with this resource. Our theme for the Easter season comes from the song of the same name that we will sing at the communion table on Easter Sunday and throughout the rest of the season. 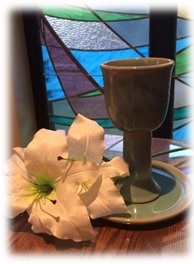 In “The Cup of Freedom,” we give thanks for the freedom that is ours as we live as “Easter People”—a people of resurrected life. We sing, “I will take the cup of freedom and call on the name of God!” To “take” up this cup of love is an active gesture. The action suggests that we have the God-given power to act, to leave death behind and move toward a hope-filled future together. Throughout the season, we will claim this power to move forward, to sing, to follow, to rise again, to love, to heal, and to be opened. In the end, we are filled with the freedom of the Spirit of God. Come open your heart, mind, and spirit to resurrection!